The U.S. economy continue to grow robustly in the third quarter of 2018 (Q3), with the August jobs report pointing to the fastest annual wage increases since 2009. In the Eurozone, economic sentiment improved for the second month running in August 2018, while in the U.K., economic activities picked up but underlying growth is expected to remain weak. In the region, China’s monthly indicators suggest that economic activities continue to be largely stable, with expanding production and private investment. However, official PMI indicator for new export orders continue to remain somewhat soft in August indicating a moderate pace of factory output in Q3. In Japan, economic activities remain robust, driven by the acceleration in capital expenditures and exports. The outlook for Q3 is likely to be more moderate, judging from the slower pace of consumption growth in July, and the potential negative impact from weather-related/natural disasters during the quarter. Similarly, other regional economies reported slightly slower growth readings in the second quarter with PMI indicators suggesting that the moderate outlook is likely to continue. Foreign capital flows in regional emerging markets (EMs) have turned to net outflows since early 2018, weighed down by stronger USD and rising U.S. Treasury yields amid tighter global financial conditions. Unlike the relative calm in 2017, concerns about escalating trade tensions and to some extent, rising inflation, particularly in the U.S., have sent global financial market volatility higher since early 2018. Exacerbating this uneasy global backdrop is the turmoil in other EM regions, triggering a risk-off sentiment across EM assets. 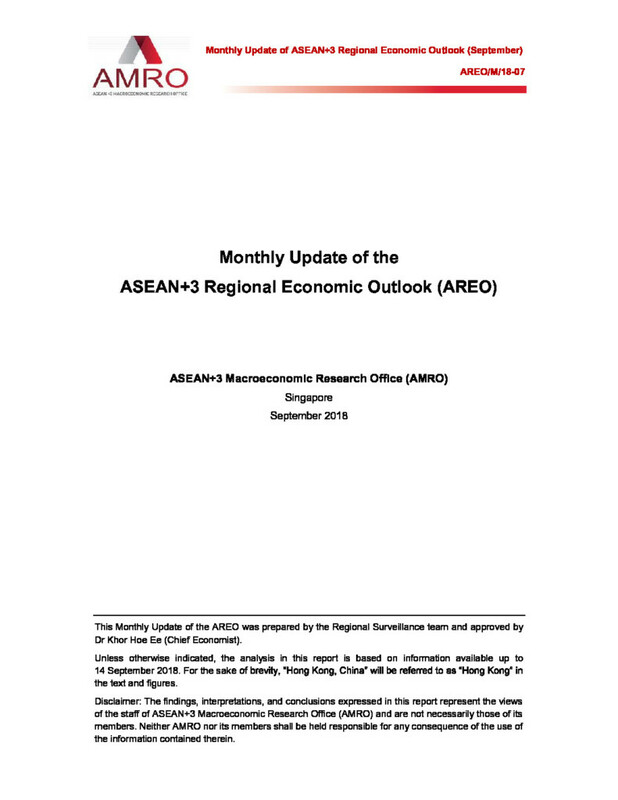 The Monthly Update of the ASEAN+3 Regional Economic Outlook (AREO) provides regular, short updates on regional economic developments, to supplement the annual AREO published in May each year. The Updates are published eight times a year, with the April and May editions incorporated into the annual AREO published in May, and the November and December editions into next year’s January Update (Special Edition).